Open Eye Figure Theatre’s new production Nothing is Something is a sweet and thought-provoking piece of art. From the creative team of Noah Sommers Haas and Liz Schachterle (both the sole performers as well) we take a journey of exploration into a strange world. We begin with an explorer and a ball, spend some time in the middle with a lost ball and two explorers, and end where we began (mostly). If that doesn’t sound exactly clear to you than I’ve done an accurate job of describing the play. It’s falls into the camp of absurdity but manages to endear itself to the audience through slapstick humor and moments of touching friendship. The beauty of this play is your ability to create your own meaning from the events that occur on stage, so I will refrain from clouding your experience with my own interpretations and thoughts. Both Haas and Schachterle give admirable performances. There is little dialogue in this play. Most of the action is through physical movement and puppetry, yet the story is beautifully told. The movements are perfectly timed (an extraordinary feat in many cases), and their chemistry on stage helps create a connection between these two strange characters. Haas and Schachterle are helped in their performance by a few arms. The arms belong to Edward Euclide, Dan Mark, Alex Stene, and Nicholas Swenson. These four men make their arms into disembodied pieces of themselves that manage to be both creepy and inviting. The arms become essential characters of the story. They are able to appear and disappear at the perfect moment—no small feat, and tell a story without actually being able to see what is happening on stage. Each piece of this play is carefully crafted to create the finished product. The music, by Eric Jensen, helps to set the ambiance before, during and after the play. Its lighthearted pings, pongs and trills fit nicely into the odd world of this play. Because so much of this play is based on physical movement and sound, the Sound Design, by Sean Healey, becomes a character in the play. The sound helps complete the idea that there is a person behind the set somehow controlling the strange rules of this world. The Set Design, by Joel Sass, (who is also the director of the play) helps complete this world. While the set is small and may not appear like much when first encountered, the mechanical workings of the stage are fascinating. Actors, arms, and puppets appear from different places throughout the piece. They go under, through and around the stage. Since the space is not that large it is impressive that Sass was able to design a set that allows for a variety of movement in this piece. 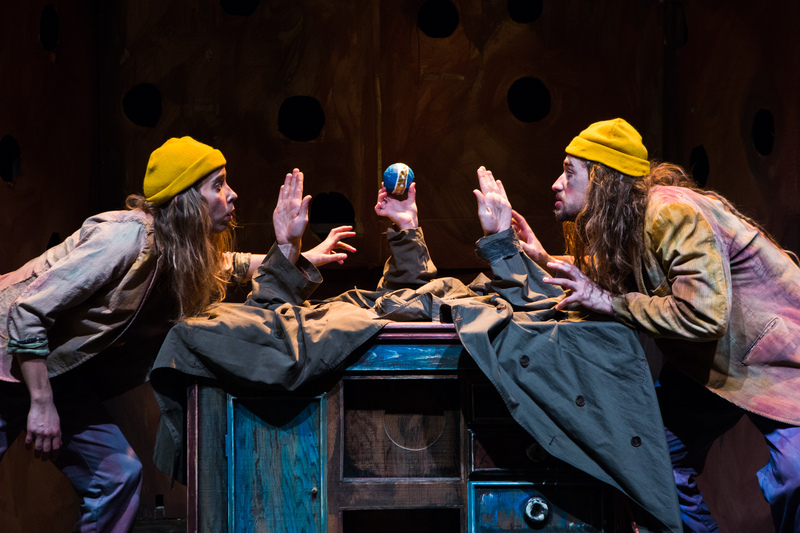 Open Eye Figure Theatre states the play is appropriate for children ages 6 and up. I add my own recommendation to that. It is appropriate for all children—from ages 6 to 96. Everyone will find something magical about this play. Nothing is Something, Created by Noah Sommers Haas and Liz Schachterle. February 20-March 8, 2015 at Open Eye Figure Theatre, 506 E 24th St. Minneapolis. Tickets $15 or pay as you are able; purchase advanced tickets at www.openeyetheatre.org.